The Kurdistan Regional Government of Iraq (KRG) is a democratically elected administrative body of the federal Kurdistan Region of Iraq. It consists of two branches: the legislative branch, represented by the Kurdistan Parliament, and the executive branch, made up of the President, Prime Minister and other ministers of his cabinet. Based in Erbil, it administers the three governorates of Erbil, Duhok and Sulaimani. The parliament is elected through popular vote every four years. The party holding the majority of seats in the Kurdistan Parliament nominates a candidate for the post of KRG Prime Minister. The nomination is then submitted to the President of the Kurdistan Region for approval. Following confirmation by the President, the Prime Minister will be tasked with forming a new cabinet. The Prime Minister presents the Kurdistan Parliament with his selection and the parliament will, in turn, vote their approval. The Kurdistan Regional Government of Iraq was founded on the principles of liberty, democracy, and human rights. Since its establishment in 1992, the KRG has dedicated itself to acting in the best interests of all the people in the Kurdistan Region, safeguarding its ethnic and religious diversity as well as its minority population, and ensuring safety and security for all. The KRG permanently aims at strengthening its services and the quality of democracy in the Region. It continuously works to increase transparency, disperse competences, and empower civil society. The KRG is also concerned with promoting international recognition of the Anfal genocide campaign by the Baath Regime, intended at annihilating the Kurdish population. After the fall of the former regime, the Kurdistan Regional Government worked hard with the interim government of Iraq to create a new federal, pluralistic and democratic Iraq. Accordingly, the KRG closely cooperates with the federal Iraqi government to ensure the application of the Iraqi Constitution. The current regional government is headed by Prime Minister Nechirvan Barzani. He presides over a cabinet of 19 Ministers that is primarily made up of members of the winning Kurdistani List coalition. The Region’s other institutions include the independent Judicial Council, the highest judicial authority in the Region, as well as the Presidency of the Kurdistan Region and its administration, the Diwan. 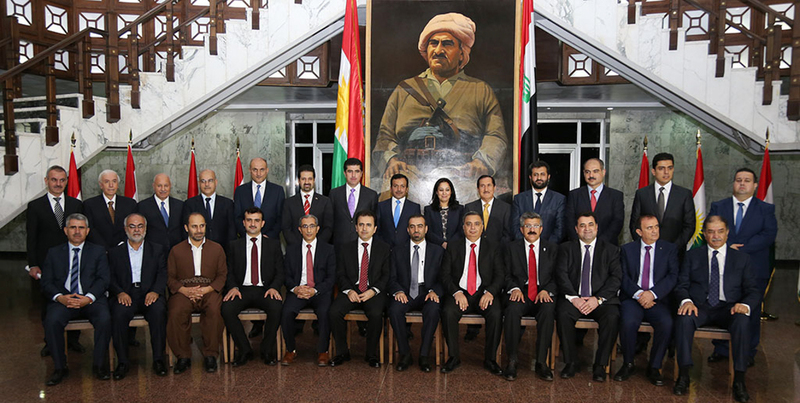 The eighth cabinet of the Kurdistan Regional Government was sworn into office on 18 June 2014 at the Kurdistan Parliament.